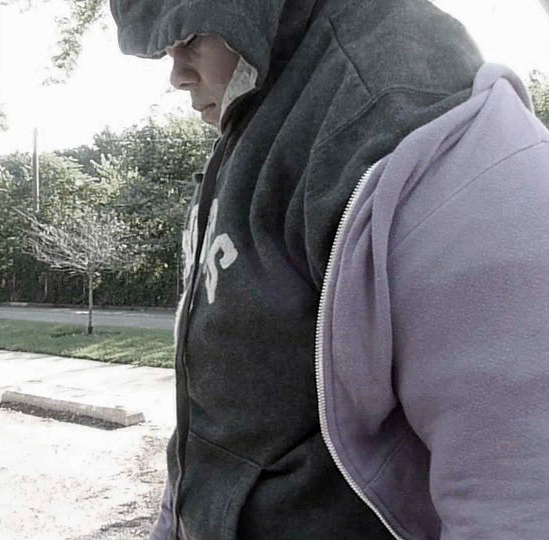 In “go/figure,” Eliza Myrie and Daniel Giles converse over problems with abstraction, distortion and obfuscation of black bodies’ representations. Their respective historical research and process-based practices make manifest obscured features in histories of African mining and the craft objects of black slaves in the American South. 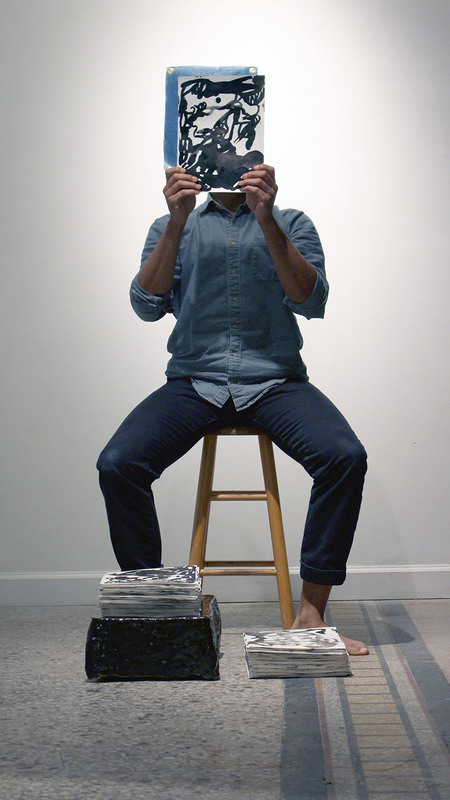 Daniel Giles in the performance component of “500 faces for the wanderer” at the exhibition’s opening reception. 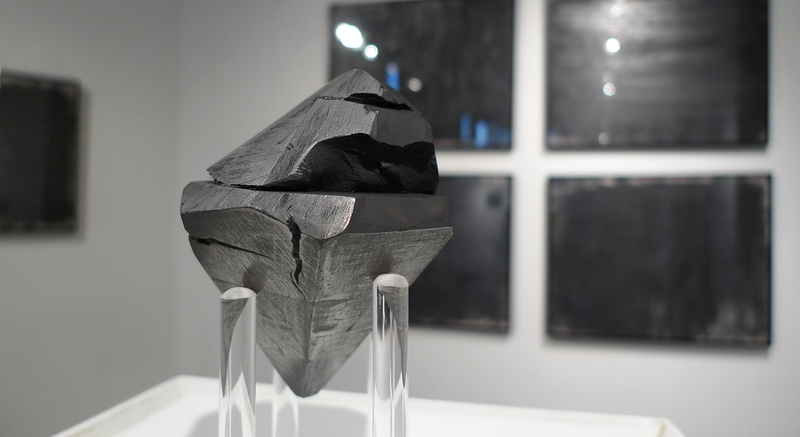 Myrie’s “diamond, diamond, graphite” is comprised of ten works on paper with dark polished surfaces that surround a hunk of graphite that has been rubbed against the accompanying sheets into the faceted form of a fanciful gemstone. The object stands in for the 601-carat diamond discovered in 1967 by Ernestine Ramaboa in Lesotho, Africa. 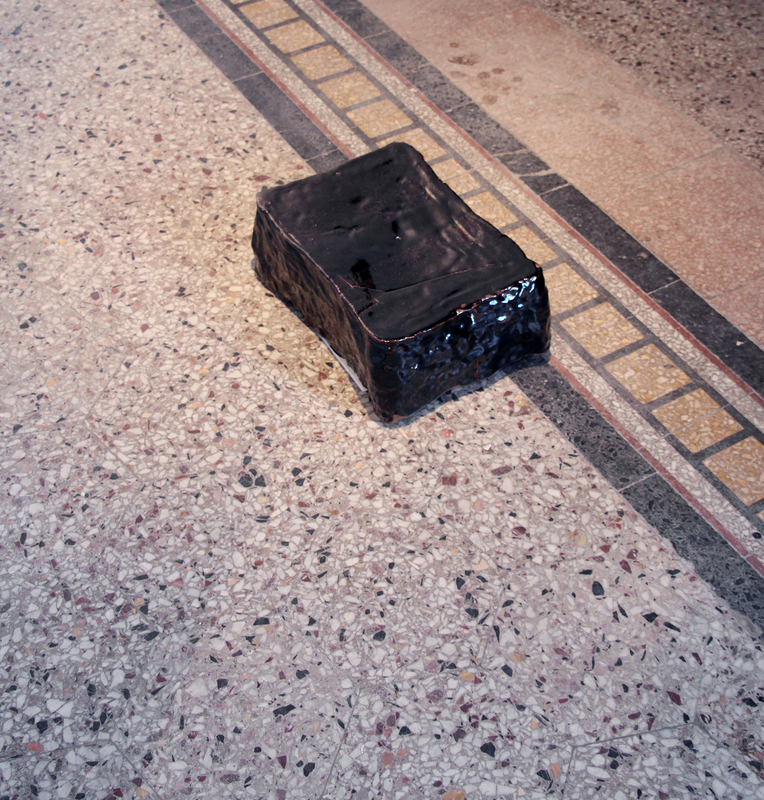 Replicating the scale and form of the diamond in graphite (both allotropes of carbon) becomes a formal and racially poetic way of blackening: Myrie’s reflection of a system of commodities that echoes Jay Z’s “All black everything.” Identity is embedded into material, which is burnished across Modernist forms of abstraction, similar to Glenn Ligon’s and Tony Lewis’ reactions to Kazimir Malevich or Ad Reinhardt’s formalist tropes. Giles’ India ink drawings function likewise, but if you weren’t at the opening, they won’t be visible. Encased in a darkly glazed ceramic box is a tall stack of pages that the artist uncovered in a durational performance for the exhibition reception. Beginning with a study of a ceramic face jug that is one of the only objects produced by or representative of black persons currently on view in the Art Institute’s folk art gallery, the image loosened further in each subsequent work that Giles held up in front of his face, a creeping reminder of abstract painting’s debt to African masks and figuration. Like Myrie, Giles’ intersects black history with interrogations of the materials, modes of representation and conventions of display that constitute contemporary visual art vocabularies. Through October 18 at Roots & Culture, 1034 North Milwaukee.